Cutting Control, presets feeds and speeds according to material specification. 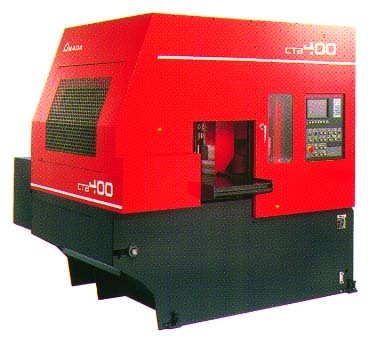 The Model CTB-400 Band Saw Machine was developed for high production, accuracy, and economical cutting. This state of the art machine is specifically designed to use the multifaceted Amada carbide band saw blade. The combination of these two has achieved in excess of 100 square inches per minute cutting rates, with surface finishes in the range of 62 RMS while holding accuracy well within + 0.001 per inch of diameter. The worlds first CNC Optimal Cutting Control (Patent Pending) presets feeds and speeds according to material specification. This unit has 229 factory installed material specifications with 100 available for custom materials. Feeds and speeds are automatically set to achieve the most economical cutting with the highest productivity possible, while maintaining noise levels below 85 decibels.